Every so often, a design idea strikes me, and I run with it. Leaving aside for a moment my obsession with string, pretty much the most popular thing I’ve ever sold here is my Colonial Eggacy design (available on mugs, T-shirts, fridge magnets, and more). Two of my patterns were featured in the Irish Times Magazine back in 2010. You can buy them here. 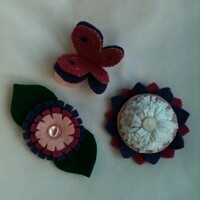 With this pattern you can make the Super Simple Flower Brooch, the Fancy Frilly Flower Brooch, and the Beautiful Butterfly Brooch. This is a seven-page PDF file, and includes photos, templates, diagrams, and full step-by-step instructions for making these pretty projects. Perfect for quick gifts! With this pattern you can make the iCatching iPod Cozy. This is a six-page PDF file, and includes photos, templates, diagrams, and full step-by-step instructions for making this cool cozy for your groovy tunes. Or for someone’s groovy tunes – it would be a great gift. The pattern is designed for the iPod “Classic”, but I’ve also given instructions for adapting it to other sizes.